The Dutch Computer Chess Federation (CSVN) is proud to announce the 10th International Computer Chess Tournament (ICT10) from 28-30 May 2010 in Leiden, The Netherlands. During the world championship in Sofia, armchair grandmasters all over the world saw Vishy Anand’s winning attack in the final game, due to the magnificent calculating abilities of chess computer programs in sharp tactical positions. However, there were many positions in Sofia in which the computers showed a lack of understanding. In game 9, in a very unbalanced position, in which Anand hat two rooks and a pawn vs. a queen, even the strongest chess engines had no clue what was going on. If you go through game four of the match with a chess engine, you will see that most engines do not foresee Anand’s crushing attack. And there are many more examples in the match that show that chess programs simply make the wrong moves. For this reason, it is interesting to see the development of chess programs and the unique chess computer tournaments, organised by the CSVN and the Dutch Computer Chess Federation. This year, the 10th ICT will be played in the Denksportcentrum in Leiden, The Netherlands with 14 programs. It is a nice mixture of top chess programs like Rybka, Hiarcs, Shredder and Junior and amateur programs like Pandix, The Baron, Spark and Kallisto. Since the CSVN celebrates its 10th edition of the ICT, the board decided to invite some prominent programmers from the USA to Leiden. Don Dailey (Komodo) and Larry Kaufman will attend the tournament and will be happy to answer questions from visitors. It is also exciting for the organisers that some brand-new versions of top engines play in Leiden. Rybka 4 has just been released this week, Hiarcs 13 is brand new and Komodo has just been updated as well. But world class engines like Shredder, Junior and Deep Sjeng will also play with improved versions. We are looking forward to a weekend of top level computer chess in Leiden! Chess Grandmasters couldn’t do much against computers in two exhibitions organized this month in Italy. In four games, machines scored three wins and only one match ended in a draw, thanks to the efforts of WGM Elena Sedina who held “Equinox”. That game was played in Genova during the “Festival della Scienza”, the most important scientific manifestation in Italy. On the same occasion, Equinox, software written by Giancarlo Delli Colli from Roma, won against GM Igor Efimov of Monaco. Time control was one hour per player and computer and about 100 people followed the games in vivo, in addition to the good coverage by the newspaper and RadioRai. 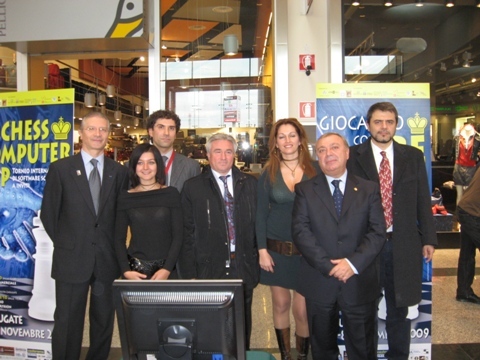 Genova is a possible candidate to organize the 2010 computer chess world championship. The “computer week” ended on November 6-8th in Carugate, a nice village near Milano very well known by its giant markets. The second match Human versus Machine was part of a three days long festival, named “Giocando con i Re” (eng. “Playing with the Kings”). The festival’s second edition was organized thanks to the town-councilors (assessors) Paolo Molteni and Michele Bocale and the lord mayor Umberto Gravina. Beside the computer challenge, the festival included numerous chess events – one reserved for computers, one open to the children, a simul by GM Lexy Ortega against 40 opponents and a conference on chess and computers. Mr Gianpietro Pagnoncelli, President of the Italian Chess Federation, attended the festival. The match Human versus Machine featured WGM Olga Zimina from Modena and GM Stefan Djuric from Montecatini (both are now Italian citizens) playing against “Leila”, written by Carmelo Calzerano, and “Chiron”, written by Ubaldo Andrea Farina. Both computers defeated their respective human opponents. The first three rounds were played inside the giant-market “Carosello”, and during the 7 hours of play at least 10.000 people took a look to the “players”. We have to mention that not all of the programmers were present. Foreign machines had beautiful girls, Sonia, Valentina, Antonella, Eleonora, Silvia and Rose-Mary, employed as movers and this really caught the attention of the audience… Many people thought that the girls were actually playing and refused to believe that there were programs involved! 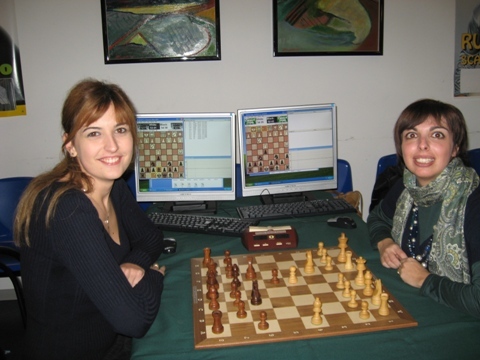 Italian Festival della Scienza Futuro, which took place in Genoa (Genova), featured chess matches between titled chess players and chess program Equinox. The games were played on November 1st at the central “Biblioteca Berio”, Via del Seminario 16. WGM Elena Sedina played her favourite Moscow variation as White against Equinox and earned a draw after 27 moves. GM Igor Efimov tried the Trompovsky attack, but the chess engine defeated him after 33 moves. Equinox also competed at the Computer World Championship in Pamplona some months ago. The next Human vs. Machine is planned to take place on 6-8th November in Carugate. News by Adolivio Capece. The fifth Livingston Chess960 computer chess world championship will be held from July 29-31. Four strong programs will play the preliminaries on Wednesday and Thursday, the four game final between the best two programs will be played on Friday. After two open tournaments in 2005 and 2006, the organization decided to upgrade the format into a double round robin with only the best Chess960 programs in the world and brought the world championship into line with the human events. How to determine the best Chess960 program in the world? The two finalists from last year, Rybka, by Vasik Rajlich and Shredder by Stefan Meyer-Kahlen will be challenged by two internet qualifiers. This year, the Belgian program by Gian-Carlo Pascutto won the qualifier, which was organized by the Chess Tigers in conjunction with the Internet Chess Club (ICC). The German program Ikarus, developed by the Kolss-brothers Muntsin and Munjong, qualified for Mainz as well. Rybka, which is leading the Chess960 rating list, to be found on http://www.computerchess.org.uk/ccrl/404FRC is the defending champion and definitely wants the hattrick! She (Rybka is a she!) won the final in the new format in 2007 and 2008. Rybka also won the ICGA world championship in Pamplona, Spain in May 2009 with a great score: 8 points/ 9 games, and also clinched home the blitz title. Sjeng and Shredder shared second place in Pamplona, with the Israeli program Junior. The “Kolss bros” do not often participate in computer chess tournaments anymore, but their program should not be underestimated. In 2005, Ikarus debuted in Mainz with an excellent fifth place in the Chess960 world championship, one year later the program played even better and landed on the winner’s podium on third place. Ikarus scored its best result in 2006 when the program won the blitz world championship in Turin, Italy with 11 points/13 games and left top programs like Rybka and Shredder empty-handed. Once again, we can expect an exciting computer chess tournament this year in Mainz. The programs will have equal opportunities because in Mainz all programs play on equal hardware, which is provided by the sponsor of the computer tournament, Livingston-the IT rental company. The machines, running on a 64 bit Windows XP system have Intel Core2Quad Q9400 2,67GHz/1333MHz processors. Sponsor Livingston and the Chess Tigers are happy and proud to welcome the four top Chess960 computer programmers to Mainz! Junior was supposed to get at least clear second place having in mind computer ELO ratings. Draws with Deep Sjeng and Shredder were logical, but the draw with Equinox (the Italian program at the event) stirred the table. Junior finished with the same points as Shredder and Deep Sjeng and only the tiebreak (Sum of Defeated Opponent Scores) gave Junior the silver. Hiarcs, running on the same Intel Xeon W5580 @ 3.2GHz x 8 as Junior, finished 5th with 6,0/9. It did well against lower rated opponents, but achieved only 2 draws against the higher placed computers. Jonny finished a stable 4,5/9 managing to score 4 victories and a valuable draw with Shredder. The lower part of the table is completed by The Baron, Equinox, Pandix 2009, and Joker. 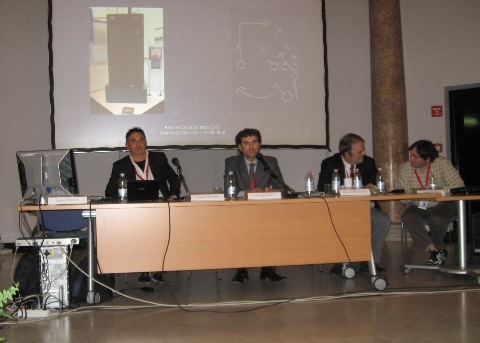 The XVII World Computer Chess Championship will take place 11-18 May, 2009, in Pamplona, Spain. The championship will be part of the International Week of Computation which will be held in Palacio del Condestable. Other events include the Advances in Computer Games conference, the XIV Computer Olympiad (with the modalities of Chinese Chess, Go, Checkers, Hex, etc. ), and many additional seminars. The official opening is on Monday 11.30 hours, in the playing hall. There will be 10 participants in the XVII World Computer Chess Championship. The favorites are Rybka (USA), Junior (Israel), and Hiarcs (Great Britain). Last seeded are The Baron (NED) and Deep Sjreng (Belgium). Here is the full list. The last two events were dominated by the current world chess champion Rybka. In both events there were not many participants (10 in Beijing 2008 and 12 in Amsterdam 2007). The event with most participants so far was the 1999 Paderborn championship with 30 participants. If you ever wondered how many programs are there, here is a comprehensive list of computer chess programs. A request by many of the users of Chessdom.com is already a fact. The Chessdom Chess Shop opens it’s doors! It consists of a fine mixture of educational and fun chess materials, books, and software, provided by major companies such as Convekta. There is a special section in the Chessdom Shop dedicated to the world chess champion – the Rybka family section. Currently there are about 100 products in all sections. Our promise is to add products on a weekly basis and increase the number of offers to more than 300 by 2008, so that the Chessdom users can always find the most adequate chess material. The Chessdom shop will be open 24 hours a day at http://shop.chessdom.com/. In order to use it you need to make a simple registration and have a PayPal account. Other payment options are available as well, please, contact us for more details. From opening literature through middlegame tactics to endgame combinations. The texts can be found in the book section. It features famous authors such as Maxim Blokh, Alexei Shirov, Anatoliy Karpov, Alexander Kalinin, Igor Berdichevsky, etc. You can find the best games of the world champion Vishy Anand commented as well. In this section you will find quality educational chess software that provides an easy shortcut to increase your chess level. Feel free to browse through the catalogue and find the engines, databases, or tactics practice that you need. The world computer chess champion is the king of the Chessdom Shop. It looks nice and sweet, but beware, it bites! With a strength of 3000+ ELO, Rybka is a great chess partner, analysis tool, opening teacher, and much more. The Rybka family includes the new multi processor version and the 2007 openings database, both download and cd/dvd version.